The sandwich is a lunchtime staple, and sometimes it's nice to treat yourself to something a little more exciting than ham and cheese with a packet of ready salted. The following sandwiches, however, are serious. Packed with luxury ingredients they've got a price tag to match. 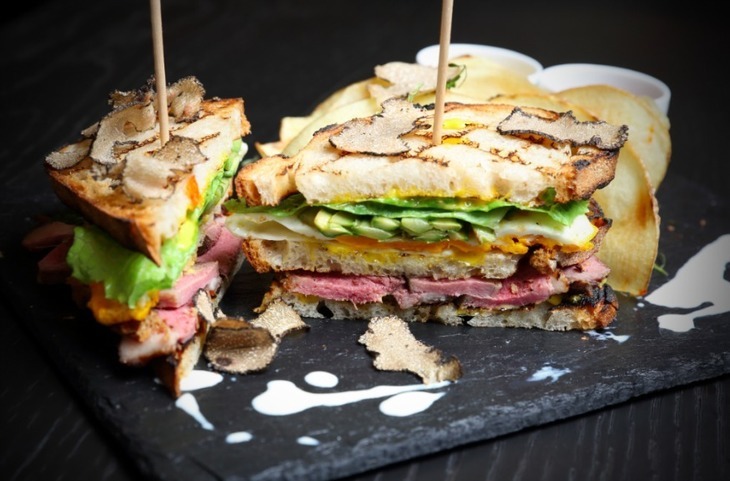 Would you fork out for London's most expensive sandwiches? 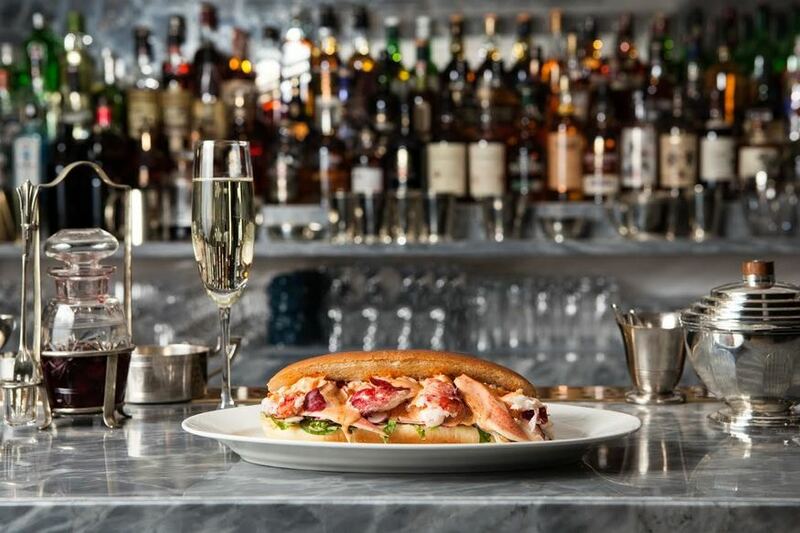 Let us start with a relative bargain and a London classic — the lobster roll at Hawksmoor. You'll find it on the bar menu at Seven Dials, where it should be enjoyed with a portion of their triple cooked chips. This is a lobster roll served warm, with butter, rather than cold with mayonnaise (as at Burger and Lobster, for example). It's a whole lot of lobster too, coated in garlic butter then piled into a soft bun. There's bearnaise sauce on the side because there's always room for more butter. What's great about this sandwich is that it really feels luxurious. We actually think it's worth every penny. It will come as no surprise to find high end department store Harrods on this list, along with wagyu beef. Prized for its high levels of fat marbling, wagyu is expensive, yet differs greatly in fat content and price depending on where it comes from. The fat is prized because it produces a very rich mouthfeel once the beef is cooked. The burger is served with chips in a mini silver champagne bucket. Naturally. For the same price, you can also have the prawn roll, served warm. The prawns are marinated and served in a soft roll with sweet chilli and herb mayonnaise. That's one seriously expensive prawn sandwich. The steak and lobster burger at Brown's. 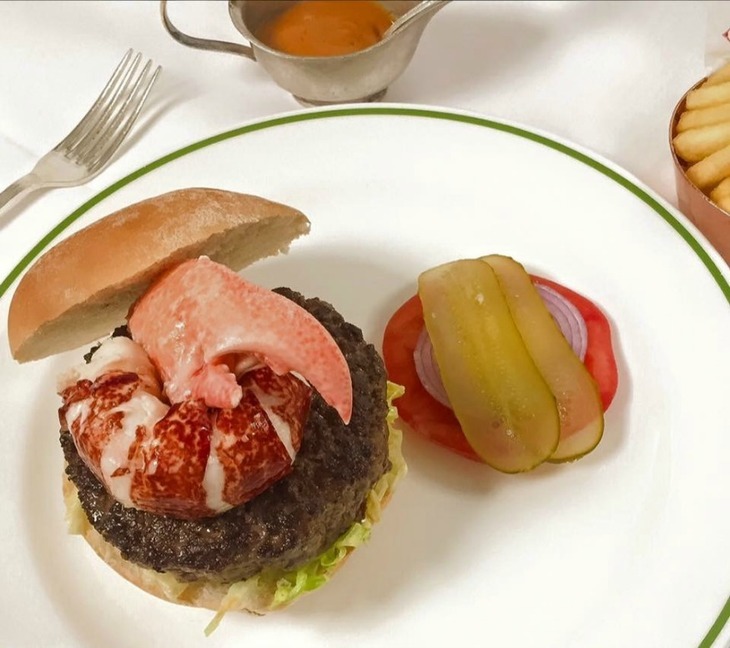 This burger is available without lobster for £23 but really, if you’re going to eat a burger here, you may as well go all out with their surf 'n' turf version. The ground rib steak meat comes from Glenarm Estate in Northern Ireland, and the lobster is Dorset blue. It's available at The Donovan Bar, Hix Mayfair and to eat in your room, should you be so lucky to stay there. A club sandwich would usually come with chicken and bacon inside, but you can always count on The Ritz to add a touch of glam. You'll find this on the menu at The Rivoli Bar, packed with sweet Cornish lobster, mayonnaise, and the usual salad layers. The Rivoli Bar is definitely worth a visit, too, golden hued and glamorous, as you'd expect. The dress code here is slightly more relaxed than the restaurant as it's smart casual, but remember, no sportswear. The Sterling burger at The Langham. 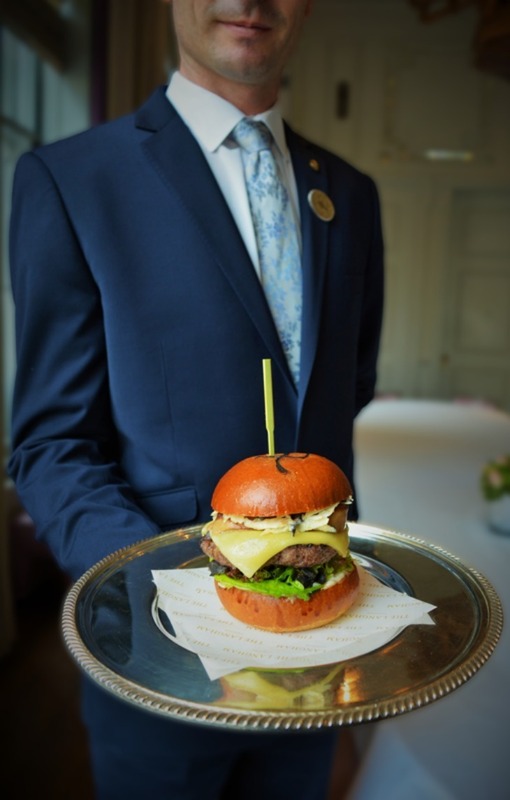 Palm Court at The Langham is famous for afternoon tea, but there are other options on the menu, such as this burger. They've really gone to town on the luxury ingredients here, with Sterling beef, foie gras, a black truffle remoulade and… some cos lettuce (every burger needs some crunch, after all). Oh and just in case you're wondering what 'Sterling' means, it's not a breed of beef, but refers to the Sterling silver present in the interior décor of The Sterling Suite, which is the penthouse suite at The Langham. The duck truffle sandwich at Tartufi. Harrods would like to point out that the sandwich changes regularly and so this picture may not be representative. You'd expect to pay a lot of money at a truffle-focused restaurant, and Tartufi and Friends within Harrods will not let you down. Their club sandwich comes with duck rather than the usual chicken and it's clear that here, rich flavours are the name of the game. There's a fried egg, too, plus potato chips (we assume they mean crisps), crispy asparagus, lettuce and of course, white truffle. A truffle burger at Tartufi and Friends. Harrods would like to point out that the current burger may differ from the one pictured. And so here we have it, possibly the most expensive sandwich in London (you never know when another will pop up). Yes, you did read that price right, this sandwich will set you back a whopping 75 smackers. So what do you get for your money? Well, it's a posh burger. 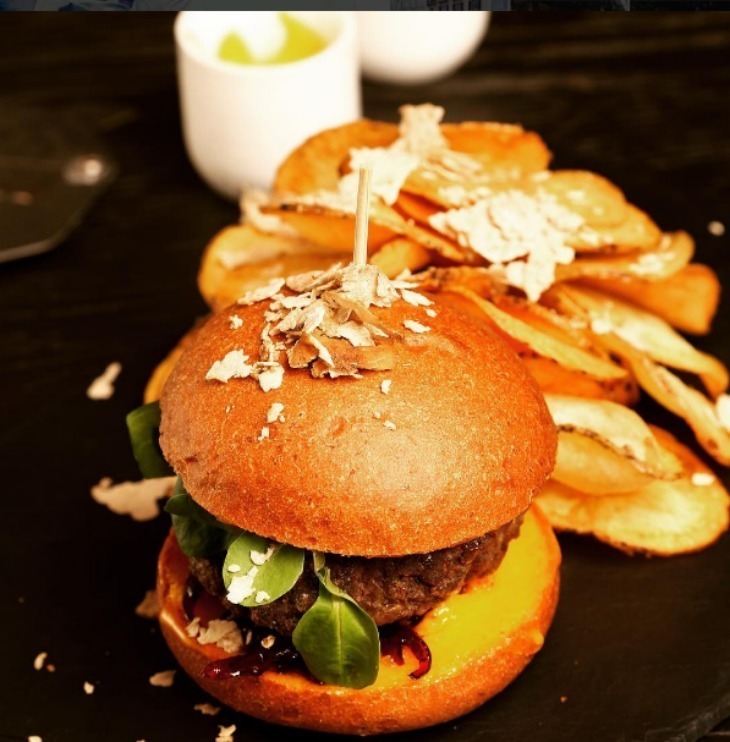 It's a burger topped with foie gras, lettuce, sweet onion marmalade, potato chips and of course, shavings of white truffle. We're not sure about this one — does anyone else think it sounds a bit sickly? You'll feel even worse when the bill arrives.